Reasons behind the mass exodus of young people from the countryside have become very clear, as it is understandable that they are generally repelled by the agricultural sector’s instability and the poorly compensated labour it offers. However, the real paradox exists in why some young people still want to farm, especially when they are not from farming families and do not automatically have access to the resources or property required to enter the sector easily. Very little analysis has been done on this intriguing segment of the population and how they are able to gain access to the necessary resources (loans, grants and education) required to be successful – particularly when their governments fail to implement policies that adequately address the obstacles they face. 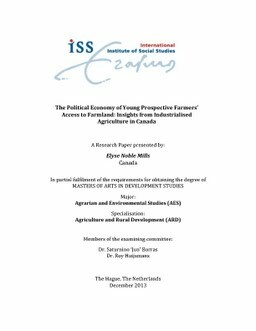 Positioned within an agrarian political economy framework, this analysis of how young farmers’ social position, familial background, and age impact their opportunities asks: How do structural factors impact prospective farmers’ ability to gain access to land, and what are the political and economic institutions that facilitate or hinder this access? How have the mobilisation efforts by young farmers’ organisations induced structural change? The Canadian province of Nova Scotia serves as a case study of an economically weak region within a highly industrialised Northern country, one that actively engages in agriculture in all ten of its provinces, and yet is facing many of the same rural development problems as countries in the Global South. Nova Scotia also contains a significant number of new farmers under the age of 35, and the unity and agency of their communities has contributed to the formation of a number of organisations that have emerged provincially, nationally, and internationally. The implication of this research is to draw attention to the existence of mobilised groups of young farmers globally and the impacts they are making on agricultural policies, demonstrating that many young people do still want to farm and illuminating the necessity for governments to provide them more support in their pursuit of agricultural careers.